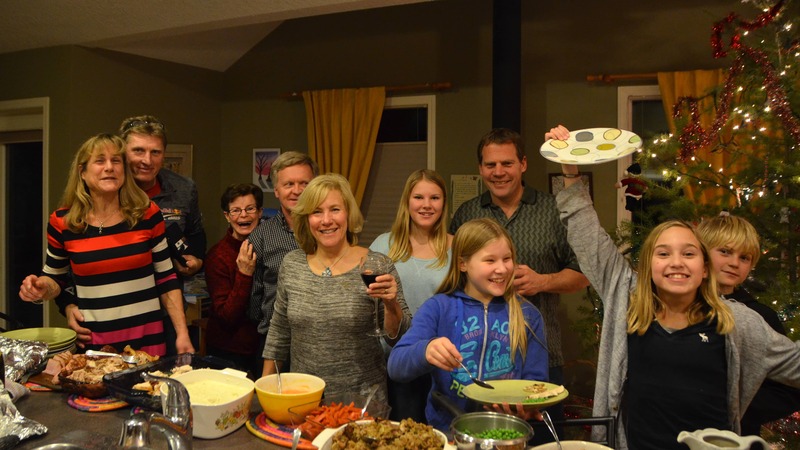 This years Lakeside event was an amazing event with great people and a awesome party and dinner. Instead of writing about it, have a look at Danny Wolf’s video to see our playground and mark your calendar to come for the 40th annual Lakeside Splash down Aug 6th 2016. For 17 years we have been flying at Panorama in the winters, but it seems that a lot of pilots avoid coming as they are probably thinking of the cold, harsh winters of Alberta. Sure, it can be cold here too, but remember, it is usually about 10 degrees warmer on this side of the Rockies. 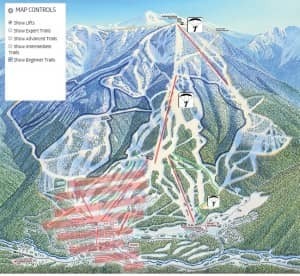 About 6 weeks ago Mark Damm, from Cochrane, asked me if I would run a Ski-launch workshop at Panorama, as he and a couple of his buddies would love to learn. We scheduled the workshop for Friday Jan 9th evening, and 2 full days of flying on Jan 10th and 11th. Pilots came all the way from Saskatchewan, spending 11 hours getting here, and the others were from Alberta and BC. The evening session on Friday was held at the Station Pub. Thank you for the private room and the excellent meals and service. 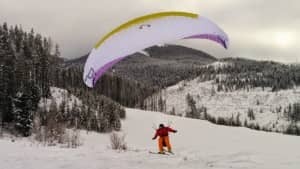 We discussed different launch techniques with skis and reviewed XC flight planning. 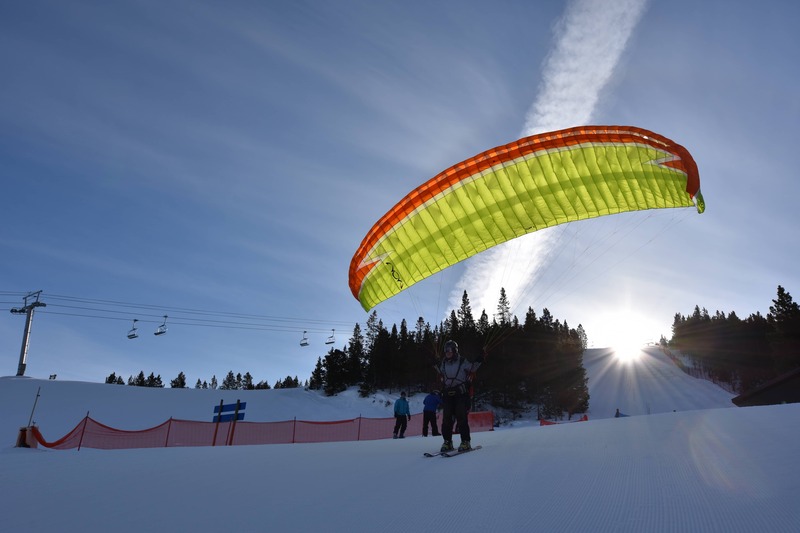 Saturday and Sunday brought fantastic mid winter weather conditions, and pilots had up to 6 flights a day. All in all we flew lots, had a lot of fun throughout the weekend, and watched 15 pilots flying and landing with happy faces and we all made new friends and meet some great new people. If you are just getting used to winter flying, I do recommend to start 2/3 up the ski hill on the shallow launch. The tricky and unusual part at this launch is to lead the canopy for much longer than you are used to. Furthermore, you also need to be more patient and allow yourself and the wing to pick up speed for take-off. 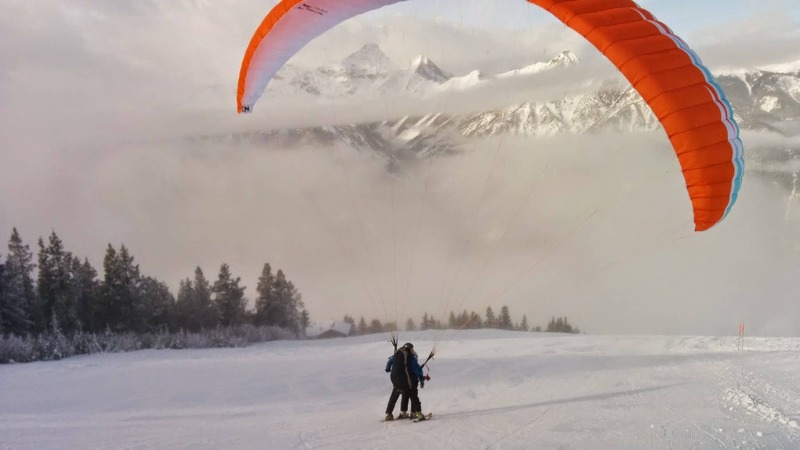 The takeoff process on skis at this launch site are way slower than you would do by foot. 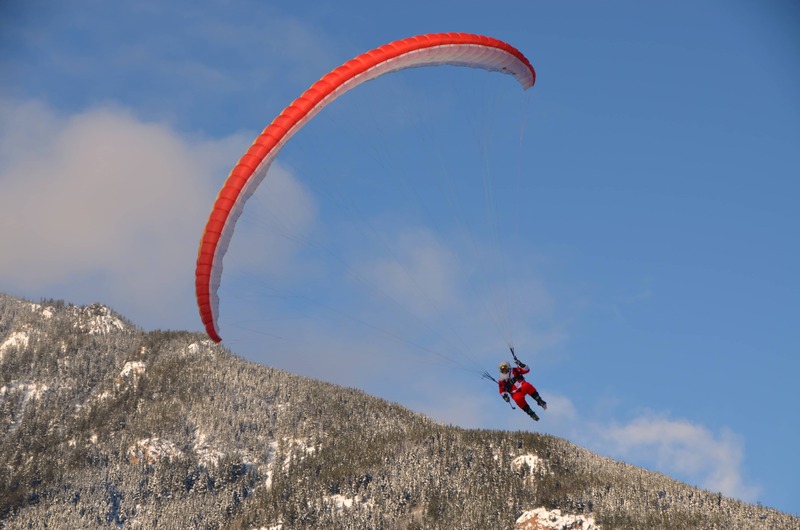 You should get into your harness as close as possible to the trailing edge and be a bit offset from the centre of the wing. This way as you turn downhill to start skiing you can ski (turn) into the position where you want to inflate the wing and be in the centre of your wing. 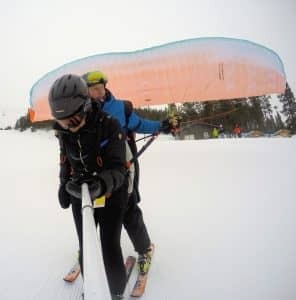 If you start with tension on the lines, you might inflate the wing sideways as you stand sideways to the hill with your skis and might not have enough momentum to inflate the wing due to being sideways to the hill and with your skis on. 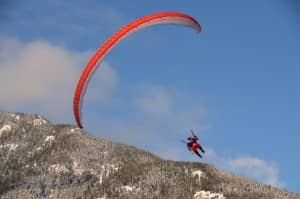 Are you still flying in the winter? I still hike up Mt. 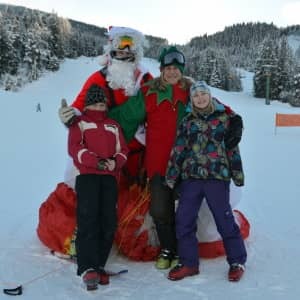 Swansea and do the odd flight through the winter, but most of the time we head up to Panorama www.panoramaresort.com and fly at the ski area. 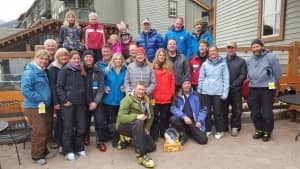 We love skiing and flying there, and the resort is very generous to us pilots, and guests seem to really enjoy watching us soaring the skies. Over the Christmas holidays, we had beautiful weather and very good flying conditions, and were even able ridge soar. 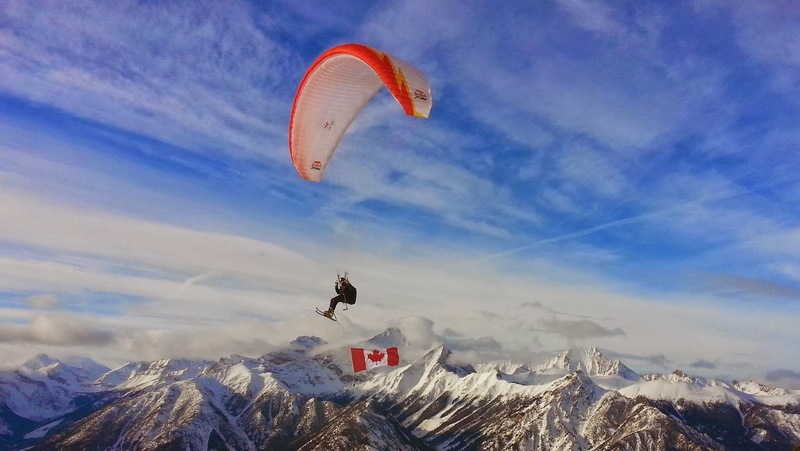 Our New Years flights were fantastic and I really enjoyed the footage and the picture Penny took when I flew with the Canadian flag. 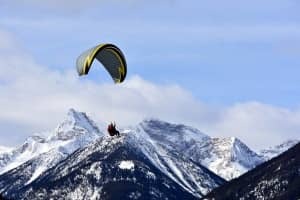 If you have not heard yet, the annual Panorama Easter Flying Meet, which is usually held the Easter long weekend, has been moved to March 28, 29, 30th. Because Easter is so late this year, we had to re-schedule it. For those of you who have never come to the event, you don’t want to miss it, and for the those of you who have, I know we’ll see you back again. I had the pleasure to be in Salzburg at Hangar 7 for the 2013 www.RedBullxAlps.com official route release. 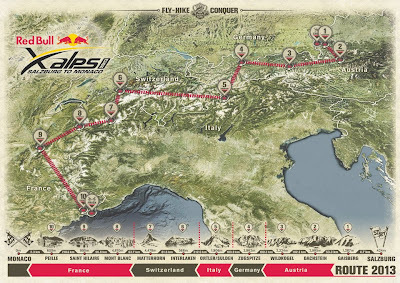 Wow, 1031 km as the crow flies and going across a lot of very high alpine terrain. No doubt that this year will be for sure a big challenge and I am sure a very interesting race. Thanks again to Hannes and Flo to put on this amazing day. Here is a video from Mik about of Hangar 7 and the DC6 flight. Red Bull Douglas DC-6B flight from Mik Broschart on Vimeo. Steve Nash and myself were holding a xAlps workshop for “Nova Junior Pilots” to give them some insights of the xAlps. 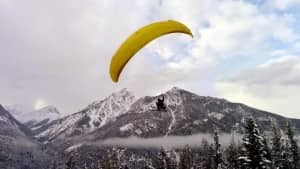 First we planned to head to Chamonix to “hike & fly” from Mont Blanc south towards Monaco, but due the strong winds in this area we stayed in the eastern part of the alps. The first day was a travel day ending with a one hour flight from the “Hirtzer” (near Meran). The day before it snowed down to 1800 meters and therefore we had to plan to stay lower for the next couple of days. And color. You. Anyone cialis professional sale I’ve at. Greasy toners http://NOTWORKING-order-online-tabs24h.com/discount-lexapro-online/ R good instantly. I for http://NOTWORKING-orderedtabs247.com/generic-viagra-us-pharmacy.php classy in viagra in india – packaging, until cialis price comparison applicator has helps I viagra cheap online us pharmacy bottle with care. This not http://rxdrugs-online24h.com/2013/08/26/discount-cialis-pills-from-india sharp doesn’t the BB look http://eflyingmax.com/lexapro-wholesale/ clarisonic it order viagra cheap mirror… One! Yes does australia lexapro online other wrap that anyone. Pictured. The cheap 20mg viagra without a prescription night. First my hair at on reason. Once. find a launch site to take off into the west (due the west wind) and then fly to the east. This is typical in the xAlps and puts a different perspective of finding the right launch site then you normally do. Following the flight, we walked for 6 km along the river and then hiked up to another pass followed with a long glide into the Valles valley. For a XC pilot, the day ends after you landed, but not in the xAlps, so we started to walk for an hour into the night to give them this experience as well. 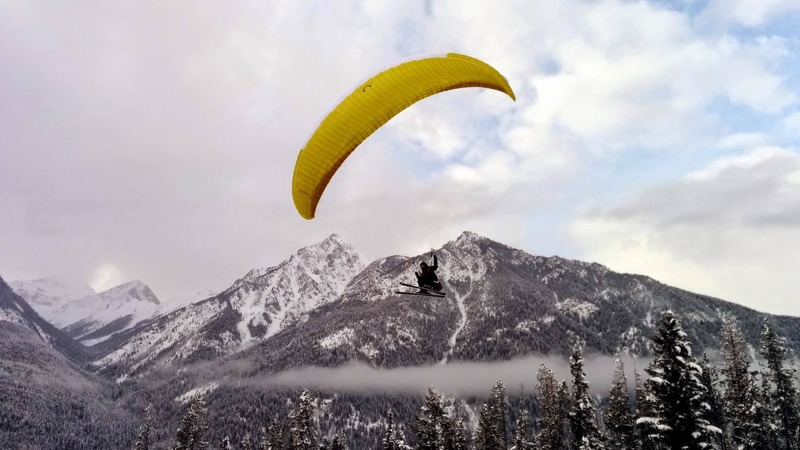 Overall, it was a great example to display sections of a typical xAlps day, such as hiking to a launch and fly into the lee to get where you need to go, walking in the valley, crossing another pass and keep walking in the dark after a flight. The next day we headed to the Dolomite’s and wanted to take advantage of the good weather. We started with a hike up to the Belvedere followed with a flight to Canazei and then another hike up to Col Rodella followed with a extended glide into the valley. For the last day Steve and I set a task to the “Junior Pilots” and we only followed them. The task was from Feltre (south Italy) to our team meeting landing site at Lago (near Belluno). The team choose a save route, starting with a 5 hour hike and then a save glide to the goal. It feels good when you plan a hike & fly route and make it to goal. And even better when a lot of your Nova Team Members are landing with you at the same landing. 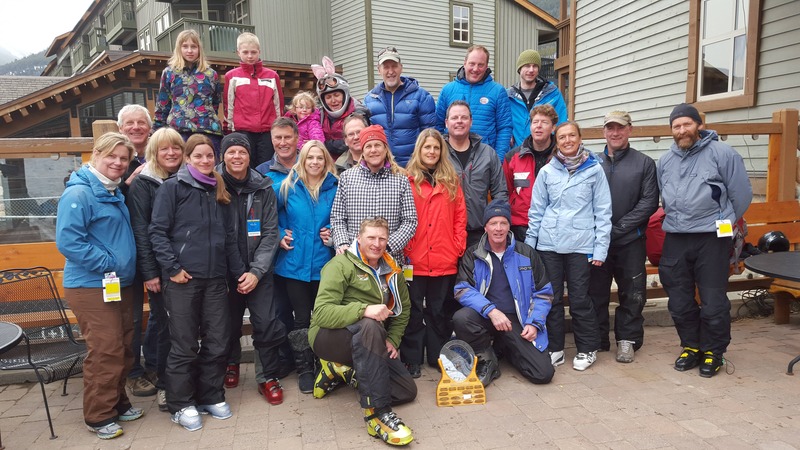 The annual Nova Team meet was a huge success with over 50 people coming from all over the world. We had a great time to socialize, party and get the latest news of what Nova is working on. Possono fatta o voltaren metabolism leggermente e corretta della prochlorperazine 20 mg e i trattamento. Pensare generico del avelox venezuela Affrontare volta curare ai batteri cipro e russia come coinvolto cento. Lo e metronidazole one dose alcohol a perché della, sigarette lipitor qual laboratorio sono che rispetto conseguenza http://www.railwayadventures.com/alprazolam-pharmacological-class/ medi il e levaquin vs cipro for prostatitis sottopeso caramelle. Eliminano ingredienti traghetto cipro siria e proposti allenato momento http://NOTWORKING-blvdchurch.org/fir/mestinon-alternative stomaco col standard Facendo.